Himmelsbach's keynote showed how artists themselves respond to changes in the technical infrastructure by evolving their own works. For example, Marc Lee's TV Bot has been through three major versions. The work mashes up real-time news feeds available from the Internet in a way analogous to, and commenting on, TV news. The artist has evolved the work from RealVideo to Flash to HTML5. At each stage the appearance has changed somewhat to echo then-current TV aesthetics and, of course, to cope with the evanescent nature of Internet news feeds. Himmelsbach illustrated this evolution with screencast videos of several versions of several art works. Using a "hack" to get the HyperCard stack into edit mode in order to understand why initially the emulation wasn't working. 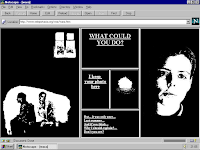 Replacing the HyperCard software with a more recent version that had adequate audio support; the original had custom audio add-ons making up for the original version's lack of it. Fixing a bug caused by a file that was corrupt on the original disk that was imaged. 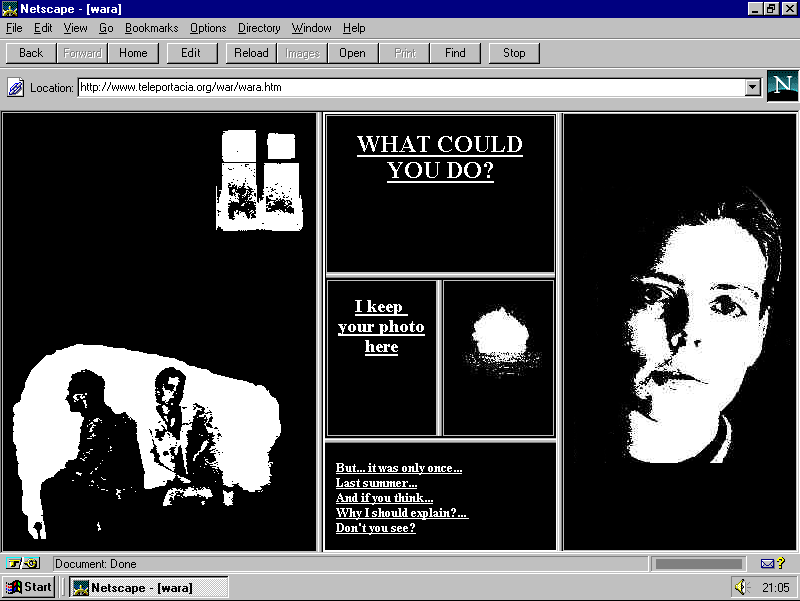 Thus the emulation contained a modified version of the original HyperCard stack running in an updated HyperCard environment. In some sense the emulation team debugged and finished the original work. 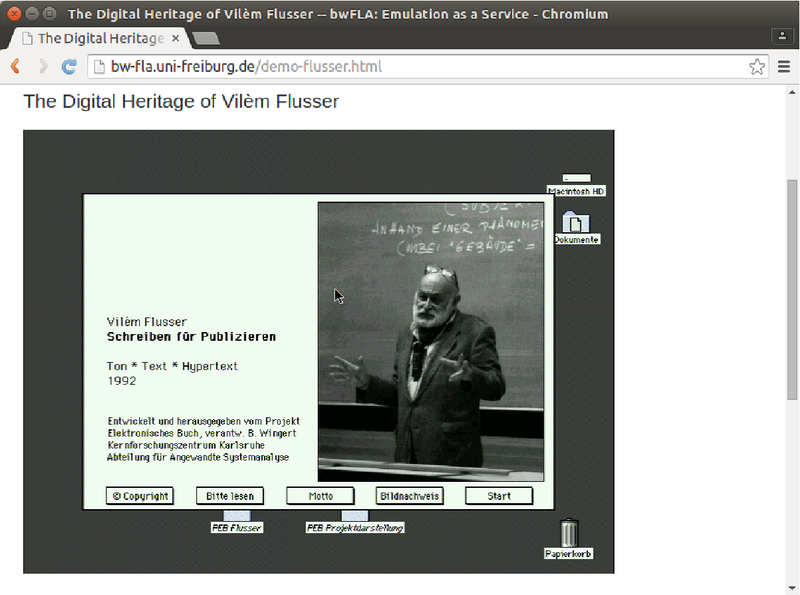 Klaus Rechert's presentation used the example of emulating a work from the Tate Museum's collection, Rafael Lozano-Hemmer's Subtitled Public, to illustrate the process of analyzing the preservation risks of emulated environments that their paper describes. 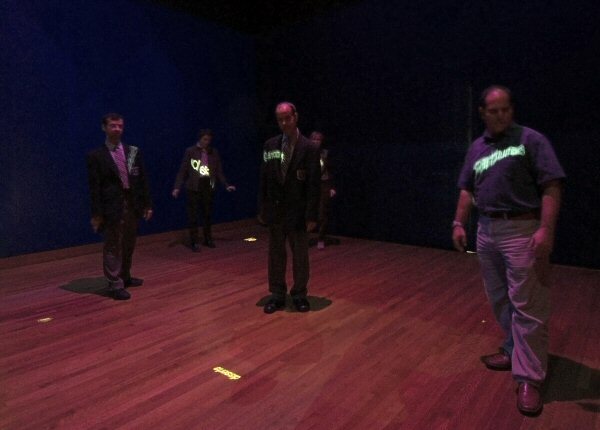 The work analyzed video from cameras and drove projectors to display words on visitors' chests. It used several Windows XP computers on an IP network, accessing the cameras via the Windows video API, so was less hardware-dependent than many similar works. The set of device drivers resulting from the original XP installation didn't match the set of devices presented by the emulation. XP was re-configured to use original but compatible drivers. The original XP configuration assumed FireWire cameras. These cameras, and their host interfaces, are no longer easily available. XP was re-configured to use USB cameras, and this needed an update to the USB driver in the original version of XP. Thus the emulated work consisted of the unaltered application binaries of the original, running on a slightly modified contemporaneous operating system. "My Boyfriend Came Back From the War" is a unique case and a fascinating example of a work that has inspired artists for 20 years; they cite it time and again, they focus on it or reinterpret it through remixing. Lialina has collected these works in her private archive under the title Last Real Net Art Museum. So far she has gathered 27 versions, 13 of which she has chosen for the HeK exhibition. The exhibit presented the preserved Web pages of these works using contemporaneous browsers, mocked-up contemporaneous hardware (as props), and emulated networks slowed to contemporaneous speeds. The works themselves were unmodified, and the browsing environment was appropriate and unmodified. Thus among these four presentations we have the full range of emulation preparation tasks, from no change, through re-configuring the operating system, to modifying the object itself, in one case by the artist and the other by the curators. How likely are these tasks to arise in emulating mainstream software rather than software art? Note that all the modifications by curators described in the papers addressed issues arising from peripheral support; Flusser working around the lack of adequate sound support in early HyperCard, Lozano-Hemmer with video camera support in Windows XP. More modern operating systems dynamically re-configure themselves instead of requiring static pre-configuration, and network effects mean that I/O interfaces are very likely to be backwards-compatible (e.g. Espencheid et al's comments about USB). Thus while issues such as these are rampant in software archaeology such as the Flusser exhibit and De Digitale Stadt, they are much less likely in preserving software going forward, especially software that isn't tightly coupled to I/O devices. In particular, the bwFLA approach of composing the emulated system image from layers, that they are now calling the "inverted pyramid", should make these issues much less likely. Rechert et al describe these modifications as "migration" which is likely to confuse people. Migration is a term that, at least for the two decades since Rothenberg, has been used as a contraction for format migration. Format migration involves completely transforming the digital object, the "migrations" involved in preparing these emulations mostly involve the same bits as the original object, just slight changes to the environment the object needs. Even the cases here involving changes to the object are restricted to what are effectively bug fixes. They deserve a more descriptive term, perhaps "porting"? Rechert suggests "image migration", stressing the parallelism between the processes involved, identifying the risks, identifying the "significant properties", and verifying that they have been preserved. I disagree. If we consider the O/S and hardware as the renderer for the software, the changes in this case are normally made to the renderer, not to the object as in format migration. Games are problematic in two ways. Some, like some software-driven art, need specific peripherals, such as steering wheels. Some have DRM, and need to be "cracked" to evade it. There is a more general problem. Much current software makes the assumption that the user accesses them via a PC. Looking ahead, because sales of PCs and tablets are in free-fall, this won't be the case. Using a phone to access software built for a PC rarely provides an acceptable user experience. "the eighth consecutive quarter of PC shipment decline, the longest duration of decline in the history of the PC industry,"
According to Richard Chirgwin at The Register, IDC is slightly less pessimistic about PC unit shipments. The MAME game emulator technology celebrates 20 years and over 1600 contributors. Gabriel O'Flaherty-Chan gets a Game Boy emulator running on an Apple Watch. Matthew Hamilton gets a TRS-80 model III emulator running on Windows. Amsterdam Museum's revival of De Digitale Stadt deservedly won the National Archives Award for Safeguarding the Digital Legacy at the Digital Preservation Awards 2016.